We are very pleased to release this book officially to the public, as it is a very special month for our author, Steven Disney. We are also honored to have assisted in the completion of this milestone, and wish it to be remembered that he has truly done something with his life. Way to go Steven! Happy Birth Month, good sir. A heart once whole, passes through the forest of life, battered by the joys and sorrows therein. THG StarDragon Publishing is pleased to assist Steven Disney in displaying that whether heterosexual or homosexual, all hearts are the same, and all people desire love. Order directly through the above link from our chosen print facility, or via email (ladyrainstardragon[at]hotmail.com, subject: book order) to be invoiced. You may also take the ISBN with you to your favorite bricks and mortar bookstore and assist in helping this author becoming more well known by asking your store to do the ordering for you... especially useful if you do not yet have a Lulu customer account. The first submission arrived today toward the anthology. I'm looking forward to more coming in, because I very much want this project to move at the hoped for pace. I still am waiting to receive submissions to "The Dragons' Beads: A Treasury." Today I've submitted the renewal to Bowker for our online ISBN log. I'd gone in to enter the information for this and for Steven Disney's "Mend this Heart" and discovered that more time had passed than I thought. I will also be drafting updates for our main portal, as that needs some updating very badly. Thanks again to Rowan Wookey and Web Design for All for providing the space and maintenance for that. Current Guidelines can be found by following this link. This post is left here for archival purposes. Have you always wanted to be an author? Have you ever wondered how to start down that road? Do you have the courage to show others your work? 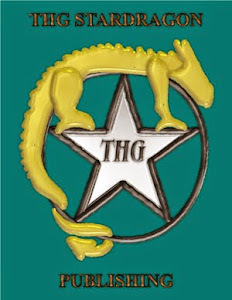 THG StarDragon Publishing is gathering submissions from young authors and poets (18/19 and under) for “The Dragons' Beads: A Treasury.” Each submission should be no more than 10 pages long for short stories, or two pages for poetry submissions. Please make submissions on standard sized (8.5 by 10 in) or A4 paper, or at a similar size in .doc or .odt, format if submitting digitally. If your submission is longer, please note it so that it can be taken into consideration as how best to include it. Edit: Now open to all ages. The theme for the anthology is dragons, so let your imagination run wild... Use them as main characters or supporting characters, good, evil, or in between. Lazy or brave, Western, Eastern, extraterrestrial or from the depths of the sea, we want your dragons! Out of all the submissions, 10 short stories and 10 poems will be selected. THG StarDragon Publishing reserves to right to choose more to fill the book depending on the length of the chosen submissions. Those that are selected will receive a free copy of the book for themselves, and a discount off the cover price if they desire to purchase additional books for their family members. This is a small press, so how well the sales go will determine how soon any possible royalties would be paid. Please note, original copies or disks will not be returned, so please keep a copy for yourself. By sending a submission you affirm that you have parental permission to participate. Edit: Submissions will stay open until enough have been received to fill the book. Feel free to circulate this announcement freely to any and all that may have interest. No, not on my own poetry. I just finished reading over Mr Disney's manuscript. I would have been done sooner, except classes sucked up a large portion of my time making it impossible. I have yet to get in contact with Faith again and check her progress, but things are looking good. So after I hear back from the author I will begin with getting things ready, that way once the editor has finished looking over, we'll be ready to rock whether or not she found anything that I missed. So this past week has been EXTREMELY productive! I am also feeling a lot calmer now that papers are out of the way for now. I might start stressing again soon, but the lull is a very good thing and will hopefully be long enough to allow me to build back up. Our editor and I have been having life difficulties as of late. My schooling has eaten a large chunk of my time as of late, though I am anticipating an increase in free time again for at least a couple weeks. I plan to use that free time to finish reading our newest author's manuscript so that we can move further in the publishing process. I also plan to check in with our editor and see if she has had any time to get further on her copy. Things have been busy for us lately. I myself have been mostly swallowed by classwork, as I have been taking university courses for seven weeks now. Our lovely editor has been dealing with her health problems. As of Tuesday she hasn't been able to look over the newest manuscript (Mend This Heart by Steven Disney) we have been working on, though she is very excited about it. So since we are having a nice get together at my home this weekend, if she hasn't gotten to open and read the file by today, perhaps she can have some time to do so here, as she just adores poetry. I'm going to be setting up an account for her when I bring her over, so that when she gets internet access of her own, she can also be heard from on this blog. When she does, I'm very sure that there will be many interesting things shared here. Doing my best to make this enterprise work has been teaching me a lot over the years. With very little to start from, it's a tough thing to get the ball rolling. It's been an exercise in perseverance and passion, in not giving up just because "it's hard." I'm still looking for submissions on the still ongoing Dragon Magic anthology, which is currently still untitled. Anyone that has done magic involving dragons is welcome to submit an essay, whether you are an otherkin identifying as dragon or fully human. Religious background does not matter. There is also currently no deadline, since I've not even had time to work on my own contributions. Regarding the Dragon Shaman novel series, I have also not had time to do any further work on the third book in the series. I do plan to take the time after this semester is over, or perhaps sooner depending on what the work load for my final class in the semester looks like once it starts. Alas, if sales were higher I could afford to take more time to write, but I have to make sure to do things that help support my family. Someday, there will be enough activity that this press, this effort born of a love for literature, will hopefully be as respected as other, older, bigger presses and generate as much income for those that collaborate together to make it happen... but today is not that day. Today, we continue to nurture the seed, and do our best to learn from the examples set by other companies. THG StarDragon Publishing has actually come a long way, on looking back, but we will always have further to go. We are pleased to announce that we will be publishing Stephen Disney's first poetry book, entitled "Mend This Heart." We hope to be ready to release it later this year, the release date has not, as of yet, been set. "Mend This Heart" is a chapbook length collection that will carry you through the highs and lows of life, and is guaranteed to be an eye opener! I just got off the phone with my editor, and I've got some bad news. Her funding she has been living on will run out soon, and she now has to apply and begin the fight for getting SSI (Social Security Income). She can work, if it's brain work, but only if so... physical labor is out of the question. What she is specifically interested in is proofreading, spell checking, as well as editing, she does it all. I'm VERY happy with how she helped me with "Dragon Shaman 2: The Smoky Mirror." She feels strongest and is most interested in ready fantasy novels, science fiction, and poetry. Romance history is also something she wouldn't mind editing. Basically, anything that you have that needs an editor, she's open to. She's most open to manuscripts 500-800 pages, but again... anything that's out there, she's up for. She's also willing to edit a book for free if you are happy with her work and another customer comes to her using you as a referral. She has no net presence as of yet (we are working on that), other than myself... and living two towns over and over the mountain (literally) she doesn't come to my place often. She does have a computer though, so she can take files or hardcopies through the mail and get them back to you via that route in the meantime. Yes, I have permission to share contact info. Looking into the going rates for freelance editing, she is definitely willing to charge far less than prices I'm finding. She isn't out to empty your wallet... And seeing that some editors would have charged me $1000 to go through my manuscript, I nearly fell off my perch. So I've definitely been lucky to have her. Please pass the word along to anyone that you know that is looking for editing and proofreading... whether your kid in college, a friend you know working on a book, or anyone else. And if anyone knows of any openings in publishing firms for editing, let me know so I can pass on the info (or you could give her a call). Linkbacks are welcome and encouraged. She really needs the help.